Controls have been kept to a bare minimum. Firstly, I've nothing against Nikon hiring a naked Kate Moss to help promote the S6. Just like Homer Simpson with his can of 'Nuts and Gum', I can't help but think that two of my favourite things are together at last. But funding Kate's legendary 'flower bills' - the contract is rumoured to be worth £1.5 million - obliges Nikon to shift a fair few of these cameras. So is the S6 up to the job? Design-wise, the Coolpix S6 could have been made by Apple - not least because it features the industry's first iPod-style click-wheel. Its stylish metallic case slips into the hand with consummate ease. Controls have been kept to a bare minimum, the better to show off the camera's generous 3-inch LCD and that handy click-wheel, here called a 'rotary multi-selector'... perhaps to avoid any awkward legal questions from Steve Jobs, the notoriously prickly boss of Apple. It's difficult to overstate just how innovative that 'rotary multi-selector' is. Instead of plodding gently through menus, you zip through them in seconds. In playback, you can flip through ten images per second to find the one you're after. The Mode button calls up a circular menu for choosing scene modes, movie recording and more. Better still, you can press up/down/left/right to access flash, macro and self-timer functions directly. Away from the click-wheel, the interface isn't such a model of clarity. The zoom lever is smaller than a fashionista's IQ, and moves the 3x lens at a snail's pace. The large screen is sharp, responsive and has a wide viewing angle, but washes out brighter colours. Shutter delay is typical for a compact at just under a second, unless you activate the slightly stuttery 2.2fps burst mode. 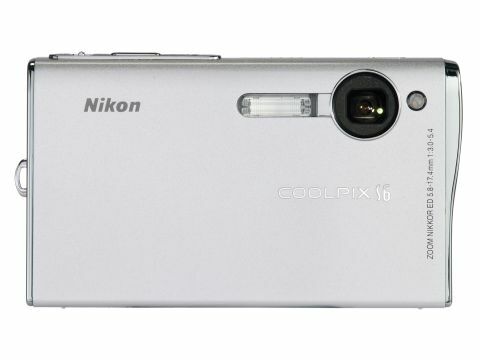 As the S6 sits squarely in Nikon's lifestyle range, there aren't many complex features to trouble a pretty face. You can adjust ISO, white balance and exposure compensation, tweak colours and move the auto-focus zone. The Best Shot Selector selects the sharpest image from a sequence, and a dedicated One-Touch Portrait button activates Portrait scene mode, Face Priority AF (to avoid blurred faces with sharp backgrounds) and Red-Eye Reduction (including post-processing of glowing retinas) although it can't handle bloodshot eyes. The inclusion of 802.11b/g Wi-Fi connectivity might come as a surprise in such a consumer-led camera, but Nikon has done its best to minimise the complexities. You run a small Wireless Utility program (PC/Mac), connect the S6 with a USB cable and enter a few details about your home network (SSID, WEP security etc.) before you start beaming images wirelessly from camera to computer or an attached printer. If things don't go smoothly, there's little help to be found, but persevere and even a supermodel should be able to get it working. Top-quality 6Mp images take about seven seconds to transfer, but it's useful if you're downloading pictures to a laptop outdoors, or at parties, where the Shoot & Transfer mode can transmit snaps instantly to your PC. However you can't use the S6 to connect to Wi-Fi hotspots to transfer images online or via email when on the road. Image quality is fine for a lifestyle compact. Photos are crisp, bright and colourful, and any attempts to fool the rock-solid evaluative metering system are doomed to failure. The weak point however is the small 3x zoom. Detail is poor (though thankfully not oversharpened in camera) and both distortion and colour fringing are visible at a times. Playback options include Nikon's occasionally useful, but sometimes erratic D-Lighting function for boosting shadow detail, and a fun Pictmotion musical slideshow with a choice of MP3 soundtracks, that does more than just lazily fade from one snap to the next. So will the S6 attain the iconic status of the Apple iPod? Well... probably not. It lacks the manual features and top-notch image quality that many photo geeks crave. On the plus side, there isn't a faster interface out there, a huge screen always attracts an audience and the wireless features aren't to be sniffed at either.